Film reviews from an obsessive Cinephile! Immediately after watching Berberian Sound Studio, I thought “this is something special from any other psychological thriller I’ve seen”. Indeed, Peter Strickland’s second film is a beautifully made triumph and a strange tribute to giallo horror! The film is set in the 1970s and follows British sound technician Gilderoy (Toby Jones) being sent to Italy to work on a horror film called The Equestrian Vortex which we as the audience, never see, instead, we witness the grueling tasks of Gilderoy having to create the sounds of anguish and suffering through your average shopping basket such as melons being hacked to bits, cabbages being stabbed, blending tomato juice..you get the idea I hope! From then on, things get very out of hand with Gilderoy’s shift in his line of work as he becomes lost in a world of sound. The film is without question, astonishing. I have to agree with Peter Bradshaw that this film definitely has a Lynchian feel to it with it’s unique dream sequences and explicit fear through not only Gilderoy, but also through Veronica (Susanna Cappellaro), a voice actress constantly under pressure and treated “like a whore” by the crew, who use various unorthodox methods to create the perfect, painful, frightening scream. The music by the electronic group Broadcast provides a gorgeous representation of anxiety, not only through linking with the giallo film as Gilderoy does his magic; but also expresses his feelings on this dramatic change in contrast to working on softer works in his native land. Along with that, Jones delivers a spellbinding performance, presenting a timid man who has the magic to create any sound, including a very intimate scene creating UFO noises with a light bulb, all through candlelight! The cinematography by Nicholas D. Knowland is beyond interesting, offering close knit shots of fear through Gilderoy and Veronica and of course, the precious items to destroy! All of this is seen whilst edited by Chris Dickens to give an almost exploitative like feeling to this very dark film. This is certainly a very unusual thriller but alluring and left me in shock and awe to it’s originality! Weird, immersive and original. 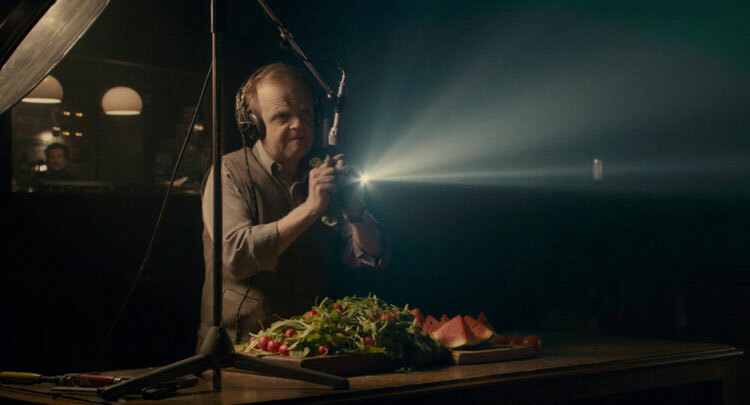 Berberian Sound Studio is something else, and something else worth I would highly recommend seeing. A top class piece of madness!